Today's comic trick comes from Chris Ware and Quimby the Mouse, his contemporary take on George Herriman's Krazy Kat theme. 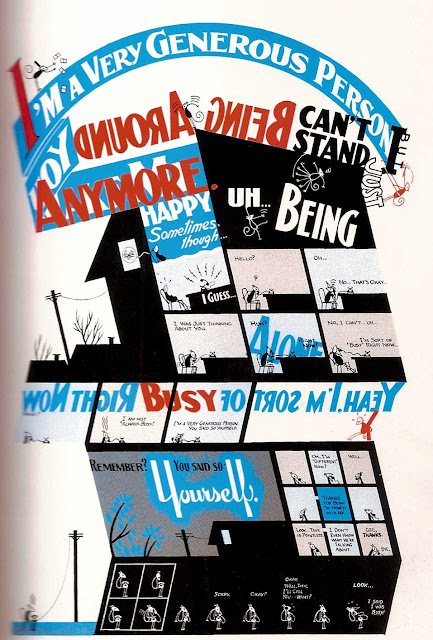 Ware, a master of design and using typography, uses words so that they're actually a part of the picture! Note how the text reads "I'm a very generous person, but I can't stand being around you anymore." But he uses the same "you" to start a new sentence, "You make me happy." He also uses the same "I can't stand" to start a sentence that reads downward: "I just can't stand being alone." The entire composition of the page is built on the words! You don't see that every day. You can see this and many other cool tricks in Quimby the Mouse!